OK, get your laughs out first. The Shed Defender is a serious product but at the same time it’s very funny and adorable. 2. Keeping your car or home clean. 3. Replacing the medical cone collar (this is what we’ve used it for). 4. Reducing allergies for the dog (for example, allergies to grass or pollen). 5. Reducing allergies for a person who is allergic to dogs. 6. Reducing anxiety for dogs and making them feel safe during travel, thunderstorms or fireworks. 7. Can protect dogs from insects such as ticks and stickers from plants that may get stuck in fur while camping or other outdoor activities. This post is sponsored by Shed Defender. Please share this post with anyone you know who might be interested in a Shed Defender for their dog. I was interested in the Shed Defender for its potential to replace the medical cone collar. More on that below. The product’s original purpose is to help contain pet hair. I can relate to that! My Lab mix Ace is one of those dogs who sheds handfuls of fur every day, all year round. He sheds about 1,000x more than our other dog and our cats combined. I use our vacuum and Swifter every day and there is always a dusting of black hair from our sweet Ace. It’s unreal. I don’t know how this dog has any hair left. For me, dog hair is a part of life but I can understand why someone might use the Shed Defender to control dog hair in certain scenarios. If you’ve just cleaned your apartment and you’re having friends visit from out of town. Maybe you’d like to keep it hair-free at least until they arrive! Perhaps you’re selling your house. The Shed Defender will keep your dog’s hair contained on the days you have a showing. You want to keep your car or someone else’s car free of dog hair. You want to bring your dog to a friend or relative’s house. If you’re getting ready for an event and need to keep dog hair off your clothes. The Shed Defender works very well for its intended purpose. It was developed by Tyson Walters back in 2011 as a way to keep his St. Bernard Harley from shedding everywhere. He said his mom sewed the first model and then he tested different fabrics and designs. “Harley wore the Shed Defender around town and family, friends and fellow dog lovers kept asking where they could get one of their own,” Walters said on the company’s website. While the Shed Defender looks tight, it’s intended to be form fitting and is very lightweight and breathable while still durable. 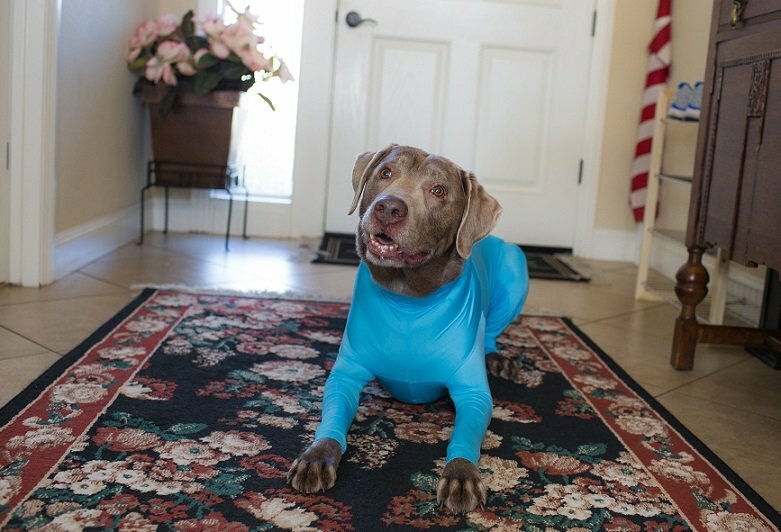 It’s made from an eco friendly, four-way stretch fabric that allows the dog to move (and play!) freely. 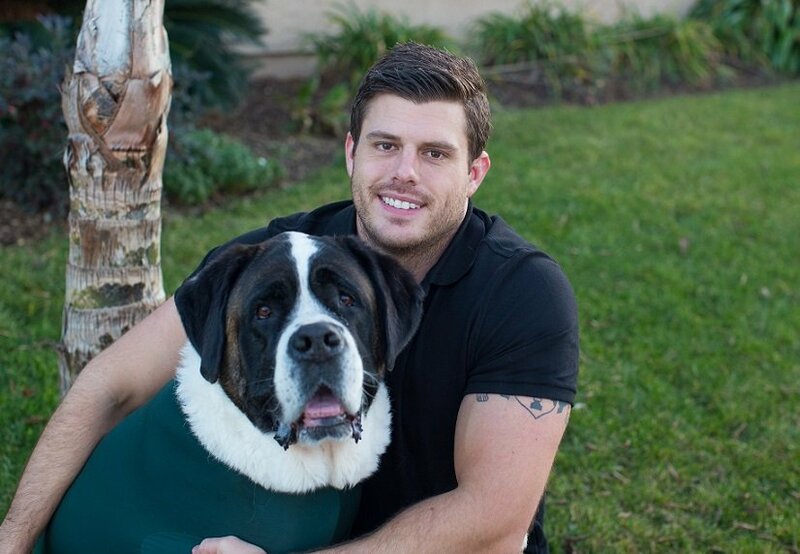 It’s easy to put on if you have a tolerant dog like Ace who’s used to wearing sweaters or coats. It will be more of a struggle if you have a resistant dog like my young weimaraner Remy! To wash the Shed Defender, you simply shake it off and then toss it in the wash. Or, you can just put it in the drier and that removes most of the hair. The best part about the Shed Defender for us is that it can replace the medical cone collar. 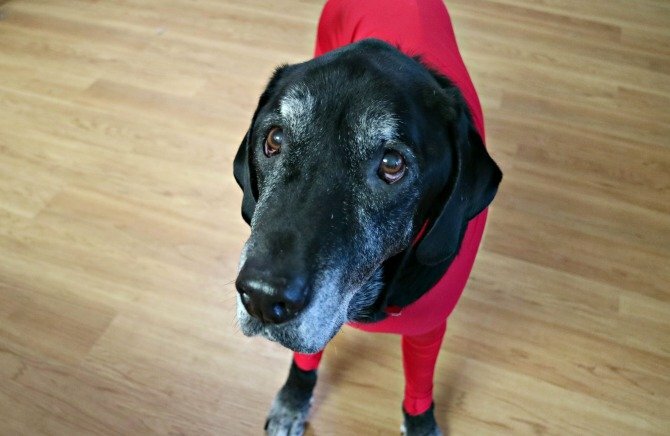 Have you ever put an old T-shirt on your dog to prevent her from licking a wound or surgery site? Last year my dog Ace had to wear a cone collar for 7 months because an autoimmune disease was causing lesions on his body. 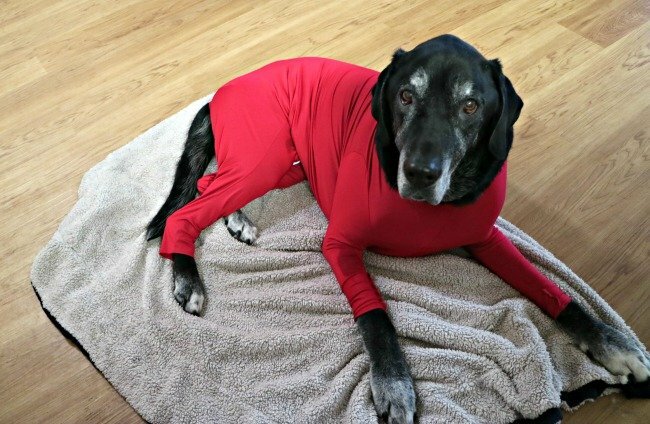 We were also putting old T-shirts on him and even a pair of old boxer shorts to keep him from licking and chewing himself and to keep his wounds covered (and our carpets clean). I know, it sounds so ridiculous but we truly had no other options. I would’ve used the Shed Defender last year to keep Ace’s body covered and give him a break from wearing a cone. Of course, you need to keep certain injuries uncovered so they can heal, so it all depends on the unique issue you’re dealing with. We would’ve used the Shed Defender in rotation with the cone to give Ace a break from the cone. What is the cost of a Shed Defender? The Shed Defender is available online in sizes mini through XXL. Prices range from $39.99 to $59.99 with free shipping in the U.S. I recommend the Shed Defender for dog owners who need to keep dog hair under control in their homes or cars as mentioned above. It’s also useful for keeping your dog covered for medical reasons or to help manage allergies for either a person or the dog. Finally, it might be something to try if your dog has anxiety during travel, thunderstorms or fireworks. The snug, secure fit makes some dogs feel safe. Use code MUTT15 for 15% off a Shed Defender (limited time). ORDER HERE. If you know someone who might benefit from a Shed Defender, please share this post with them! Do you have any questions about the Shed Defender? Let us know in the comments and we’ll get them answered for you. this is really cute, luckily my 3 gals dont shed, they are mini schnauzers. I’m jealous they don’t shed! 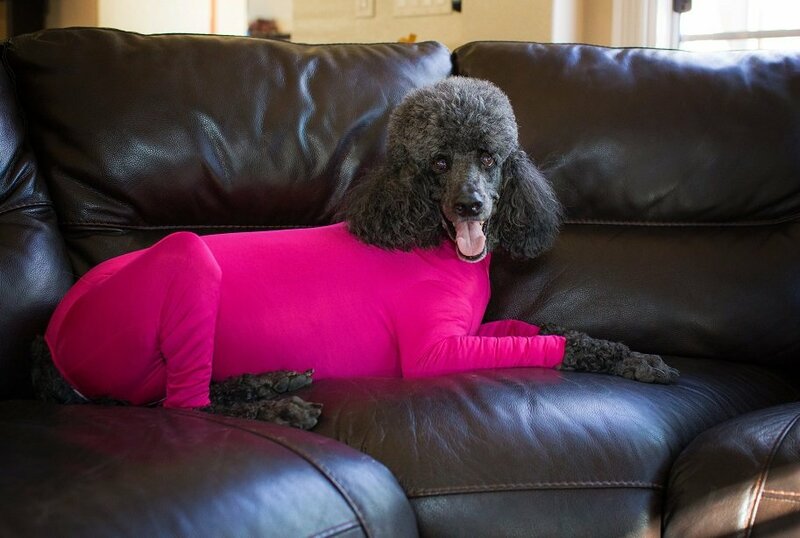 Ok my question is “Can my dog wear this always? 24/7? Because if not, it will only keep the hair under control several hours per day? It can be worn for several hours. It’s very lightweight and breathable. I wouldn’t leave it on a dog 24/7 but you could leave it on for a few hours at a time. Why? What would it hurt to leave it on most of the time? I can ask Shed Defender how long they recommend a dog should wear it. So sorry to hear your dog has so many allergies. Ace has a lot of allergies too (not as bad) so I can relate a little. I sure hope the Shed Defender gives your dog at least a little relief. Dawn, I and my little Zoe, 10 pounds (lucky she is not 110), are in the same boat as you and your dog. Same medicine plus one more pill 2x a day and special food. We have been with a holistic for four years now without much improvement, (only good thing is we found out what she is allergic to). I am really interested in this product. Would you please keep me informed once you have used your shirt on your dog. I would like to know if you see an improvement. I met Tyson and Harley today at the Pet Expo! Ace looks awesome in that onesie! I wouldn’t mind giving the shed defender a try to reduce shedding as well as to help with anxiety especially with the 4th of July around the corner. That’s great that you met them! Ace looks beyond adorable in his red suit!!! 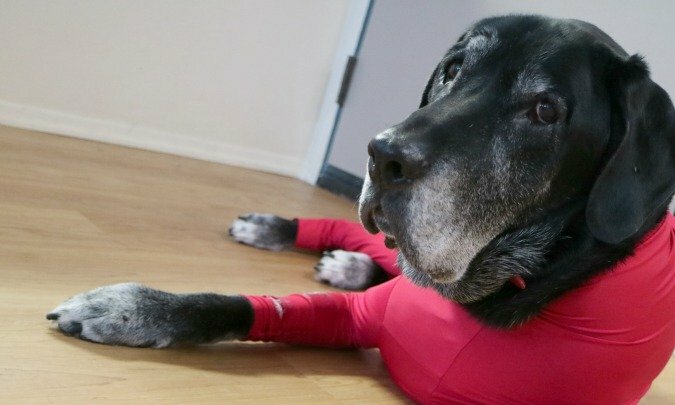 I once made Buzz wear his Ruffwear Cloud Chaser jacket to keep him from licking at a wound on his chest for a few days – it was a good solutions and definitely better than having him wear his comfy cone. But this suit would have been way cuter on him!! Any new coupon codes for this month? I would love to try this for my shepherd. Patricia, there is a new code. 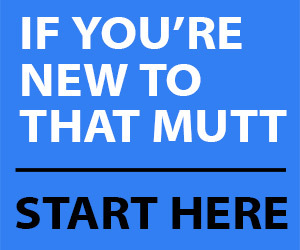 For a limited time you can use code MUTT15 for 15% off. My dog suffers from allergies and yeast, I have spend over $500 with the Vet and am anxious to try this. Question……I can not see if she can go potty with this on? I know, but I would like to know please. Also is there a coupon code that is still good? If yes, what is it and where do I add it? My girl is a Doberman so she needs the XXL. She can still go potty in this. There is a zipper you unzip and dont’ have to take the whole thing off. The code has expired but I hope this helps your girl. Thanks for your review. I’ve been thinking about getting one for my husky-shepherd mix. He sheds so much!! Just an hour after I vacuum, there’s hair all over again. I am excited to use the Shed Defender especially when guests come over. Fingers crossed that Rex will wear it. Thanks for the coupon code,too! I am going to try the suit for my little pooch, she shed so much, I am hoping this will help, she also has anxiety, so I am in hopes that this will help her.